We’re combining several places in California into one big wine stop, but we must mention that all three are very much worthy of their own mention — and we quite enjoyed the time spent visiting the areas and sampling their wines! It was our second time in both Lodi and Paso Robles, but a first for the Sideways tasting of the Santa Ynez Valley. 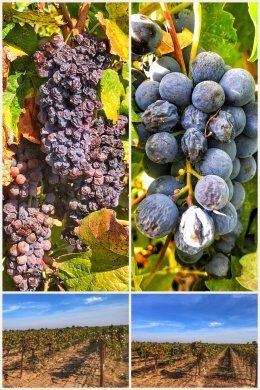 Lodi will always be a favorite place to visit because we love big and jammy zinfandel wines — and Lodi is the HOME of old vine zinfandel. In fact, Lodi is the self-proclaimed Zinfandel Capital of the World producing more than 40 percent of California’s premium Zinfandel. That said, there are many other varietals being grown in this Mediterranean climate, including grapes from Portugal, Italy, Spain, Germany, and Southern Rhone. Whenever we visit Lodi, we have to stop at a favorite winery of ours — and always fun place to visit — Klinker Brick Winery, which makes a number of enjoyable wines, some of which you can find nationwide. We also branched out to two other wineries while in Lodi. The first, Weibel Family Winery, is more known for their sparkling wines, but they also produce some solid red and white wines. Their tasting room is right downtown and a fun place to visit. We left with a bottle of Sparkling Moscato (a perfect combination of fruity, but not too sweet) and an Archgate Cellars Zinfandel. 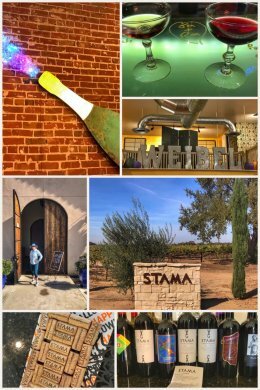 The second, Stama Winery, offers some wonderful wines — and was a fun experience partly because we rode our bikes to go wine tasting there. We bought about six bottles (and in case you were wondering, we drove back and picked them up), including: Zany Zinfandel, Curvaceous Cabernet Sauvignon, Winemaker Reserve Old Vine Zinfandel, and Tipo Rosso. 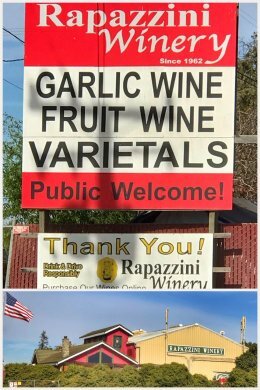 On our way to Paso Robles, we decided to take a quick stop in Casa de Fruita, a funny little area that includes a hotel, campground, fruit stand, restaurant, and more. We used this quick stop to visit Gilroy, the garlic capital of the world (well, besides maybe China, sadly)… and while we were at a cute little store called the Garlic Shoppe (which offers a wide selection of Gilroy garlic products AND has an interesting group of animals pastured next to the store, including an Italian donkey we loved), we discovered the same company also owned a winery next door — so we had to go tasting! We sadly could not taste any garlic wine (as advertised on their sign), but they do have a nice selection of reds, whites, and sparklings. We left with a very tasty bottle of Raspberry Sparkling Wine. And then it was on to Paso Robles, which will always be a magical place for us because we honeymooned here in February 2016 and had so much fun! We planned to revisit a few of our favorites, like ZinAlley, but decided to start with a some wineries new to us. 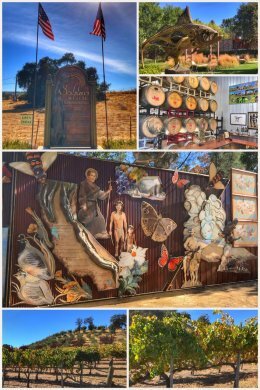 One of our new favorites is Sculpterra Winery and Sculpture Garden, which is located in the Linne Valley, just a bit southeast of downtown Paso Robles. The 135-acre vineyard is planted with a variety of grapes (including Pinot Noir, Primitivo, Zinfandel, Merlot, Cabernet Sauvignon, Petite Sirah, and others), as well as pistachio trees. Originally developed just as a vineyard and orchard, they later decided to make their own wine, add a tasting room, sell flavored pistachios (the garlic and onion flavor is amazing) and develop a sculpture garden. Another reason to love this winery is that a portion of the money from all bottles sold go to one of two non-profit medical groups. So visit for the wines, but then walk the grounds and enjoy the work from multiple artists while munching on some tasty and healthy nuts! Next up was a little winery just up the road from our campground; so close, in fact, that we decided to ride our bikes to do the tasting. San Marcos Creek Winery & Inn is a very quaint place where we had a very nice tasting flight of whites and reds. The winery specializes in small lots of finely crafted, single vineyard, estate-grown and produced varietals. In the end, we left with four bottles of wine — carefully packed in two bags so that Ran could bike with one bag on each side of his handlebars… and both wine and people arrived safely back at the campground! 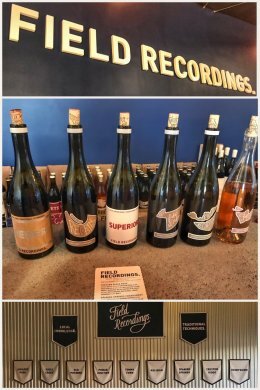 The next day in Paso Robles involved more wine adventures, with a first tasting at Field Recordings Wines in Tin City, southwest of town. The winemaker is a young, vine nurseryman fieldman who has worked with vineyards throughout the Central Coast. His wines are a catalog of single vineyard sites that produce interesting wines. In addition to the single vineyard wines, multi-vineyard blends are put together under the Wonderwall, Alloy Wine Works, and FICTION labels. We enjoyed some of the wines, and left with a few bottles. Tin City is a fun place to visit; it is an evolving industrial makers market where people come to partake in craft wine, beer, and spirits served up by some Paso’s most passionate artisans. 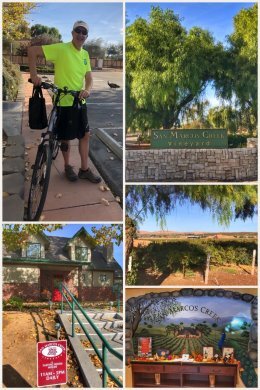 We then moved on to a great eggs/wine/pomegranates biking adventure which ended after 10+ hilly miles, 2 dozen eggs, 5 pomegranates, and a 12 bottles of wine! 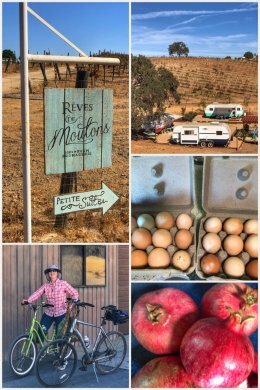 It all started with a search for farm-fresh eggs (using the great LocalHens.com website), leading us to Evan and Kristy at Reves de Moutons. They are a wonderful couple — and if you like eggs, lamb, and sheep-cheese, you should look them up. 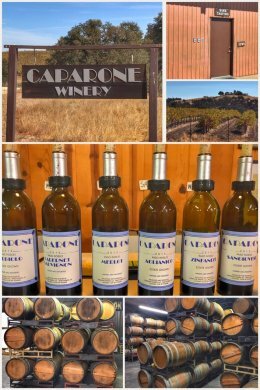 While we were buying the eggs, they recommended we taste at Caparone Winery, one of the oldest wineries in the area — and which turned out to be one of our favorite wineries in Paso Robles. Dave Caparone (and now his son Marc), have been making wines for almost four decades — since 1979 — specializing in rich, complex, single varietal red wines, made using traditional minimalist techniques and sold at fair prices. Tastings include six reds: Sangiovese, Nebbiolo, Aglianico, Zinfandel, Merlot, and Cabernet Sauvignon. The wines are indeed clear, smooth, and very fairly priced — and we bought a case of two bottles of each varietal. And Dave is a friendly, authentic, and very knowledgeable person. We left feeling like we had made a friend. We left the winery (and our case of wine) to bike back to our RV park. Along the way, we passed a large pomegranate grove — with that wonderful fresh fruit almost within reach. Happily, we ran into a worker and asked if we might be able to buy a few of them. Jenny was able to practice her Spanish, as the man said we could not buy any, but he was happy to pick some for us. We added the five pomegranates to our two dozen eggs and biked happily back to the trailer — full of gratitude for such generous souls! 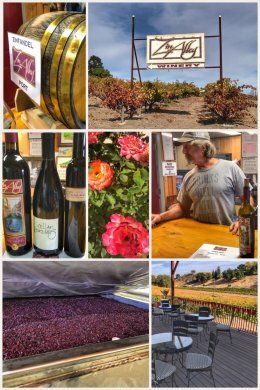 Next up was a return visit to a must-stop for Zinfandel lovers — ZinAlley — where Frank Nerelli has been making some amazing wines for several decades. With a sense of tradition, a passion for the grape, and a style all his own, Frank is producing small batches of some of the best Zinfandels in California. Frank is also a character, but a wonderful guy. And on this visit, we also got to meet Bob, who works with Frank at ZinAlley. By the way, besides the amazing Zinfandel wines, Frank also produces a Zinfandel Port that Ran swears will make your knees buckle in pure delight and taste — especially if you are not a port drinker. We ended our time in Paso with three other unique experiences. First, a wine AND spirits (made from grapes) tasting at Villicana Winery and RE:FIND Distillery, west of town. The wines were nice, but just wow… the vodka and gin were a delight, and we left with a bottle of each! Second, a crazy and unusual tasting at Kiamie Winery, which was full of a crowd of dogs and very friendly people. Third, and with some wine to help fortify us, both of us decided to do karaoke for the first time — a bucket list item. Ran sang to James Taylor’s “You’ve Got a Friend,” while Jenny got on fire, first singing Jason Mraz’s “Have it All,” quickly followed by Mary Chapin Carpenter’s “The Bug,” and ending with a duet of “Love Shack,” by the B-52s. 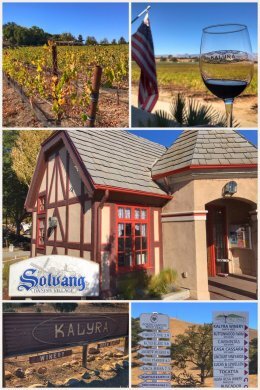 We concluded this big wine stop in the Santa Ynez Valley, with a stay in Buellton, CA, one of several towns that were featured in the 2004 movie Sideways, starring Thomas Haden Church, Paul Giamatti, and Pinot Noir. Our first tasting was at Kalyra WInery, which is where where Jack meets Stephanie in Sideways. The winemaker is Australian, and the name of the winery comes from an Aborigine term that means “a wild and pleasant place.” Located just east of Solvang (but technically in Santa Ynez) on North Refugio Road, this winery offers two tasting flights (regular wines or dessert wines) — and despite being in the movie, Kalyra sticks to its original roots of a laid-back atmosphere with an international flair — blending the best of Santa Barbara varietals with grapes from Australia, Portugal, Italy, France, and Spain. We found the wines solid, but not inspiring; that said, we enjoyed the sweeping views of the valley and mountains while sitting on the front deck, sipping our wines. 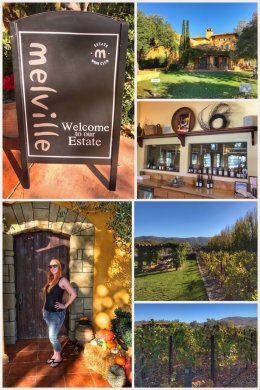 Next up for us was Melville Vineyards & Winery, which offers two tastings — a flight of some of their best whites and reds and a pure Pinot Noir flight. Officially located in Lompoc on Highway 246 in the center of the Sta Rita Hills AVA, about 9 miles west of Buellton, this winery has about 120 acres in grapes and offers small lot production of chardonnay, pinot noir, and syrah. (The vineyard grows 16 clones of Pinot Noir, 9 clones of Syrah, and 6 clones of Chardonnay.) Our tasting room attendant was quite pleasant and gave us many tips about wine-tasting and pairing foods with wines — and generously offered us a tasting flight from both lists — which included about five very different Pinot Noirs… but, ironically, in the end, we left with a bottle of their wonderful Syrah. We concluded the day — and this massive wine-tasting adventure — with a tasting at Lafond Vineyards & Winery, located on Santa Rosa Road, about 6 miles west of Buellton. We were attracted to this winery because it was one of the few we have found in the region that has been recognized for its sustainability practices. The winery has a beautiful little tasting room and offers a flight of wines that include a Riesling and a Chardonnay, as well as two each of Pinot Noir and Syrah — and which also includes a free crystal souvenir wine glass! 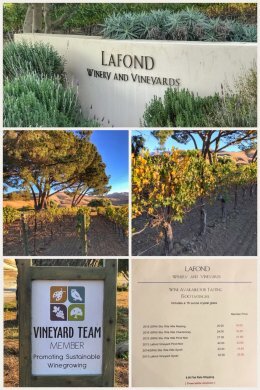 Once again, we were prepared to love the Pinots, but were surprised how much we enjoyed the Syrah… and we left with two bottles of their 2013 Lafond Vineyard Syrah. 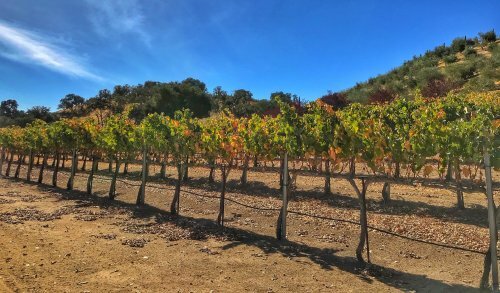 We would be remiss not to mention two fun nature/hiking adventures we had amidst the wine-tasting tin the Santa Ynez Valley. 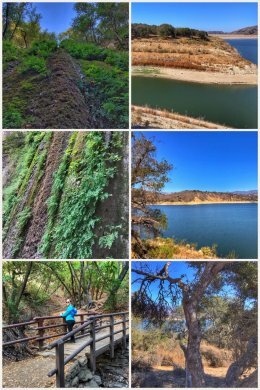 First, we hiked about 3 miles around Cachuma Lake — parking at the Vista Point and wandering around the lake shore toward the nature center, turning around at Sweetwater Creek. 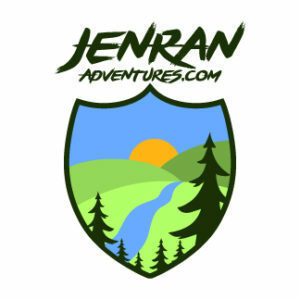 More fun was a much shorter, but cooler and greener, hike in Nojoqui Falls Park. At this time of year, the falls were just a trickle of drops, but still wonderful to see — and set in a beautiful forest. By the way, one final piece of great advice. When visiting any area for wine-tasting, go to the local visitors center and ask about wine-tasting coupons. We had coupons for either 2-for-1 or complimentary tasting coupons for just about every winery we visited on this leg. 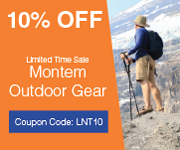 We also invested in a Priority WIne Pass, which gives us other specials and discounts throughout California, Oregon, and Washington.